BC’s new curriculum “BUILDING STUDENT SUCCESS” directs students to experience modules of the APPLIED DESIGN, SKILLS AND TECHNOLOGIES curriculum such as woodworking, drafting, and even entrepreneurship and marketing. 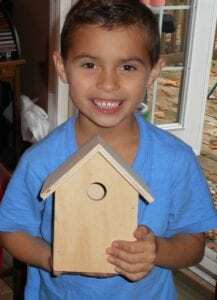 Working with elementary school teachers, parents and students, The Elementary Woodshop™ has developed a program for teachers with no woodworking experience to deliver a fun and engaging experience in “ADST”. Developed by a woodworking teacher, this program has been reviewed by educators who have played a key role in the development of the new curriculum and given us their support and encouragement. To view the Core Competencies for ADST and see what students in grades K-7 are expected to know, go to the Ministry of Education’s website at: https://curriculum.gov.bc.ca/curriculum/adst/k . We provide woodworking kits and cross-curricular workbooks for your classroom that address the ADST Core Competencies. 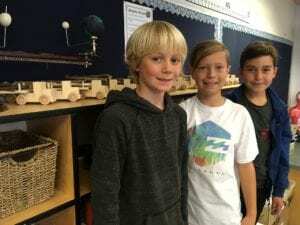 Through this true “LEARNING BY DOING” experience students can have a woodshop experience in their classroom without the need for the physical space, power tools and on-site expertise required to set up a full woodshop in an elementary school. The energy and excitement is tangible when a classroom is transformed into a woodshop. Children touch the materials, smell the wood, hear their tools at work, see the raw materials in front of them and anticipate what they can do with them. The room buzzes with teamwork and with personal accomplishment. The relevance of embedding Aboriginal Perspectives and Knowledge into the curriculum is an important step that will affect every student in BC. How to present this information is a key question for many educators. Our expertise lies in the development of Applied Design, Skills and Technologies lessons through the modality of woodworking. Working with an Indigenous Education Resource Teacher we have succeeded in integrating Aboriginal Perspectives and Knowledge into workbooks we have written to accompany the woodworking projects we have designed for students. Each of our Workbooks offers a lesson focusing on Aboriginal Perspectives and Knowledge with a connection to each woodworking project. For example, as the students are building their bird houses, they learn about modern housebuilding joinery techniques. The Workbook then illustrates traditional Aboriginal joinery techniques, emphasizing the need for ingenuity and creativity using natural resources from the local environment. We were excited to introduce our products to many educators from First Nations schools in BC at the First Nations Schools Association Convention April 12 and 13, 2019 at the Sheraton Vancouver Airport Hotel in Richmond. Students are introduced to the world of entrepreneurship with the entrepreneur component of the Workbooks. In this lesson for Grades 6 and 7, groups of students will create their own company which will build, market and sell their product. The class may have a sale of products for fundraising or may stage a “mock” sale where the students learn valuable lessons in marketing but do not actually sell their woodworking projects. The trade industries ha ve always been the foundation of a community. Our homes, our schools and our businesses are all built by tradespeople. The Workbook for the Grade 2 BUILD-A-BUDDY project discusses communities and the people who build our communities. Workbooks for other projects include a section on trade careers. What a fun way to be introduced to the world of trades at a young age. The Career Education component of the new curriculum directs students to explore a Life and Career Plan. 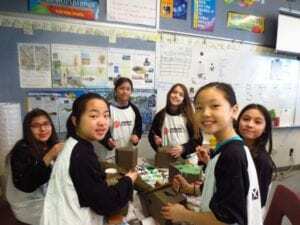 With the projected shortage of skilled workers in the trades and technical occupations in British Columbia, introducing elementary students to the world of technical fields through project-based learning expands their career skill set and their options, giving them an opportunity to taste their potential in the real world. Lead your students in hands-on work through creative, meaningful projects that teach skills to take forward into high school and beyond. We are pleased to announce that the Industry Training Authority of BC (ITA) has reviewed this program and approved it for their ITA Youth Discover The Trades grant. See “Funding Opportunities for your Woodworking Program” below for more information about contacting ITA to request funding for this woodworking program at your school. Our professional translator is busy working to translate our workbooks for your students! The Logging Truck Workbook is available in French and the Bird Feeder and Bird House Workbooks will be ready in the spring of 2019. 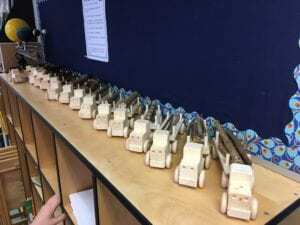 See students learning new skills with the woodworking program at a multi-grade Maker Way event, (previously known as a Maker Day) which was funded by Industry Training Authority of BC (ITA). Click on this link and scroll down to the second video on the page http://www.sd81.bc.ca/fnss/career-center/ . We’re excited to see the students’ enthusiasm and to hear the teachers’ comments about what this experience meant. The logging truck project built by some of the students includes a lesson on hydraulic principles and this district went the extra mile, taking their students to see a backhoe and its hydraulic cylinders in action! Thank you Fort Nelson School District for allowing us to share this video and congratulations on a truly inspiring ADST experience for your students. ITA (Industry Training Authority) supports resources for teachers who want to teach their students about what a trade is and spark their interest in the trades. Grants are available for hands on student events such as The Elementary Woodshop’s Classroom Kits for your school or school district through ITA’s Youth Discover the Trades Program. Funding has been increased for the 2018/2019 school year and ITA’s new simplified funding application process makes funds available to qualifying applicants and also includes younger grades. The grant application form “Discover Multiple Event Application Form” is found on ITA’s website at: http://youth.itabc.ca/educators/resources/ If you have any questions about the grant, contact your school principal or your district Career Education Coordinator. You may also contact ITA directly at: youth@ita.bc.ca . Parent Advisory Councils are a strong advocate for providing creative learning opportunities in elementary classrooms and have been very supportive in sponsoring such programs. 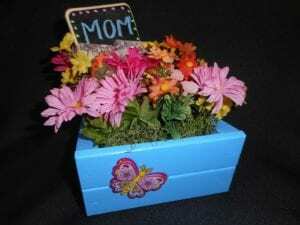 The Entrepreneurship component of the program has proven to be an excellent cost-recovery method for schools and Parent Advisory Councils with the sale of finished products at school craft fairs and for special occasions such as Mother’s Day and Father’s Day. Complete Classroom Kits are shipped directly to your school and include everything needed for creative and successful lessons in APPLIED DESIGN, SKILLS AND TECHNOLOGIES with your students. Complete Classroom Kits provide teachers with a cross-curricular Workbook accompanied by a helpful Teacher’s Resource Guide, provided for a one time use in your classroom. While the projects and workbooks have a recommended grade level, they are not limited to that grade and are successfully used by students in other grades. Everything needed to build 24 woodworking projects is included; pre-cut and pre-drilled wood pieces, wood glue, nails and screws (where required) , 24 sanding blocks and sandpaper and thorough easy to follow illustrated instructions. Extra units are available for larger classrooms. Assembly Jigs have been developed for some intermediate projects to assist the students in securing their project in place while building it. Assembly Jigs are included only with the projects that require them. Tools are not provided with the kits. Some kits use nails, some use screws and some use only wood glue for assembling the projects. For pricing information and a detailed list of what is included with each Complete Classroom Kit, CLICK HERE. We are grateful to live, work and play on the traditional territory of the Snuneymuxw People and to have raised our children in this beautiful place.